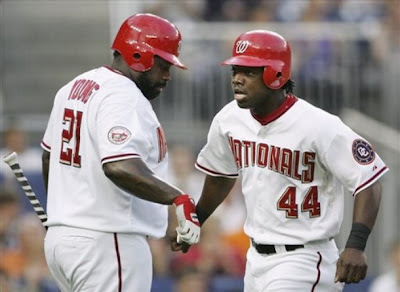 Lastings Milledge will turn 24-years old on opening day. Although it appears that he broke out in 2008, I believe there is quite a bit more fantasy baseball goodness coming in 2009. Milledge was moved around a injury (and talent lacking) lineup often last year. He also appears to have been a little unlucky with his BABIP judging by his line drive and ground ball rates and very good speed. Washington Nationals manager Manny Acta recently announced more good news for Milledge owners. Milledge will act as the Nationals leadoff hitter this season with the manager's blessing to steal bases. An improved on-base percentage and a stable place in the batting order should significantly increase his stolen base opportunities. The Nationals have an all-star cast of former center fielders and leadoff hitters (Marquis Grissom and Devon White among them) in camp working with Milledge on improving his defense and his base stealing techniques and early reports have been very positive. The Nationals' healthier (and more talented) 2009 lineup should also allow Milledge to score more runs and provide more RBI opportunities. Adam Dunn, a momentarily healthy Nick Johnson, Josh Willingham, a fulltime contribution from Elijah Dukes, and a healthy Ryan Zimmerman should transform a weak lineup into a potential powerhouse. Seriously I was excited to see that they would be hitting him first mainly because I thought that Elijah Dukes shouldn't hit sixth. Now with Zimmerman, Dunn and Dukes in the middle of the order I would be surprised if Milledge doesn't get 100 runs this season. I'm sure he won't shake hands but he might do a guest spot on the next 50 Cent record.